Check out Tobi's Fool In Love Bodysuit Backless is always a good idea in the Fool In Love Black Bodysuit. This halter neck bodysuit features a surplice construction, plunging neckline, and draped front. Pair this backless bodysuit with high waisted trousers or high waisted skirt, depending on your mood. Backless is always a good idea in the Fool In Love Black Bodysuit. 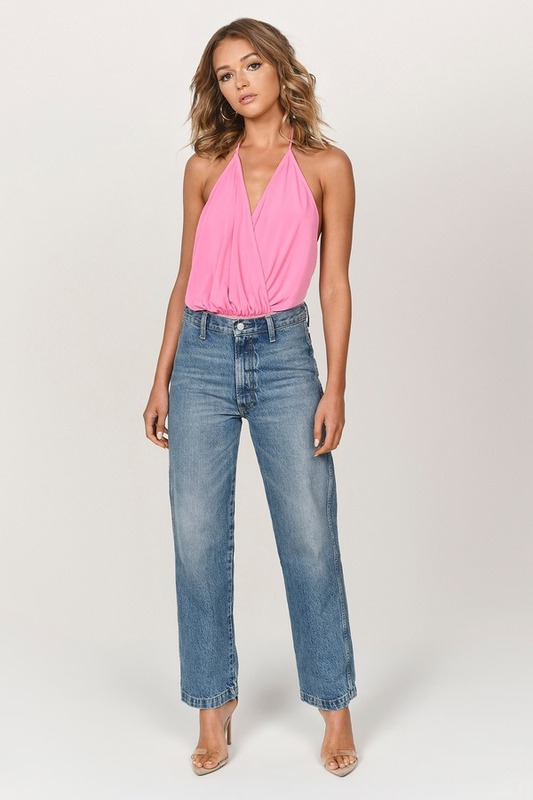 This halter neck bodysuit features a surplice construction, plunging neckline, and draped front. Pair this backless bodysuit with high waisted trousers or high waisted skirt, depending on your mood. Backless is always a good idea in the Fool In Love Pink Bodysuit. This halter neck bodysuit features a surplice construction, plunging neckline, and draped front. Pair this backless bodysuit with high waisted trousers or high waisted skirt, depending on your mood. Backless is always a good idea in the Fool In Love White Bodysuit. This halter neck bodysuit features a surplice construction, plunging neckline, and draped front. Pair this backless bodysuit with high waisted trousers or high waisted skirt, depending on your mood. Black, White, Pink modeled on a size Small.